DISCOVER THE PLEASURE OF THE PERFECT YACHT VACATION! The Caribbean is the home to a wide range of charter yachts that vary in size, shape, cost and focus. A boat of any size is called a "yacht" when its purpose and function is pleasure. So come to the islands and discover the pleasure! Also, discover why a yacht charter is such a great way to explore this vacation paradise. The temperature here is close to perfect from around 70ºF – 82ºF in the winter. Slightly higher in the summer when the winds are lighter. The most popular destination for chartering a yacht is the Virgin Islands, and for good reason; it is a relatively small cruising ground with an incredible variety of beautiful bays and beaches, crystal clear waters, with great snorkeling and diving. Ashore there are many fine dining, casual, and local food restaurants, entertainment, and beach bars. From St Thomas, U.S. Virgin Islands to Virgin Gorda in the British Virgin Islands is 35 miles and 92 bays that you can anchor in. The trade winds average 20 - 25 knots in winter throughout the Caribbean. 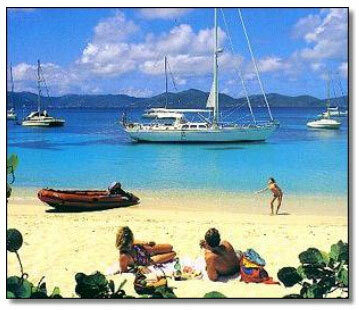 Protected by the islands, this cruising ground provides superb sailing and comfortable power boating. When you step aboard “your” yacht, your dedicated crew will greet you with a warm smile and a cool beverage. The best part of a charter yacht vacation is that your itinerary is totally flexible. You decide, with the captain’s input, where you would like to go then sit back, put your feet up, and relax. Should you want to take the helm that is okay too. Each day you will sail or cruise to a new anchorage and another adventure. On board all of your delicious meals will be prepared by the chef, especially for you. Whatever you would like to do, the crew will arrange it for you, whether it is a game of golf game or simply relaxing on board. All you have to do is enjoy! Let Ship to Shore help you select the perfect Caribbean yacht charter, and just as important, the perfect crew for an unforgettable vacation. Service begins with your initial charter inquiry, and continues as you select your yacht, itinerary, meals, and any special requests you may require to make your vacation the best ever! 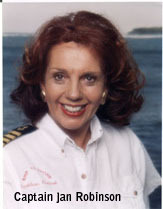 For detailed information about your “perfect yacht vacation” please call Capt. Jan today at 704-277-6521, email [email protected] or complete our Online Request Form.